The canvas panels from this series were painted after American artist Frederic Waugh's 'Paintings of the sea', which were reproduced in Walter Foster's 'How to draw' series. Imants Tillers copied one painting each week for the period of a year from the reproductions in Foster's book, including their gold frames. Six canvases from the resulting series are displayed here in a grid format. From 1973 Tillers had begun working with images derived from artworks by other artists as he moved towards an appropriation-based art. His practice was influenced by the prevalence of artwork reproductions and their role in mediating the experience of art. 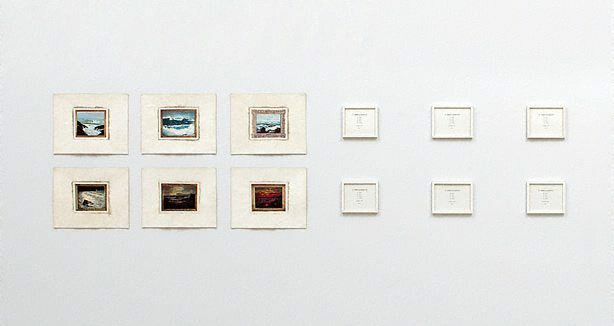 Paradoxically, his work reveals how each reproduction exists as a unique version of the original artwork, with inconsistencies of colour and tone intrinsic to each reproduction.